Mount Alvernia College takes its name and spirit from Saint Francis of Assisi, one of the best-known saints in history. It was on La Verna, a beautiful mountain in Italy, that Francis, towards the end of his life, had a mystical experience which left him with wound marks on his hands, feet and side, similar to those of Jesus at his crucifixion. The Franciscan tradition founded by Saint Francis and Saint Clare embraces simplicity, joy and profound reverence for every person, all of creation and the Creator of all. The particular Franciscan vision, which still inspires Mount Alvernia College, is that of a nineteenth century English woman, Elizabeth Hayes, an educationalist with particular concerns for the poor and for the education of women. The daughter of an Anglican minister, she learned the value of education from her father, who ran a boarding school for boys on the Island of Guernsey, one of the Channel Islands between England and France. After some years as a teaching member of an Anglican Sisterhood, her life’s quest led her to embrace the Catholic faith. She joined a Franciscan community in Scotland and eventually, in 1854, founded her own religious community, known as the Missionary Franciscan Sisters of the Immaculate Conception, in Belle Prairie, Minnesota, USA. The first Missionary Franciscan Sisters of the Immaculate Conception arrived in Kedron on 16 January 1930 – invited by the Franciscan Friars who had arrived the previous year. It was in a room of the Convent of the Missionary Franciscan Sisters at Kedron (now Delamore Retirement Community) that Mount Alvernia College began on 1 February 1956, with an enrolment of ten students and three teaching Sisters. Twelve months later, the first brick building in Cremorne Road was opened with 29 students. From those humble beginnings, the College has grown to a population of approximately 900 students, 70 teachers and 30 support staff. 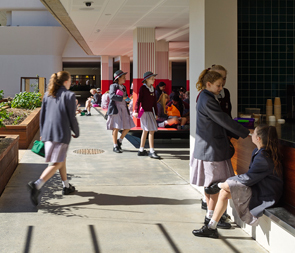 Today the College continues to grow, both in student numbers, our Alumnae, our physical environment and our community.